From the moment you put your luggage in the elevator, the luxury and convenience of this young, landscaped mansion near the sea will have you thinking you've checked into a fine hotel. The spectacular ocean views alone would merit a five-star rating, but Why Knot spoils you with everything from a private volleyball court to hair dryers mounted in each bathroom. Once you come inside, you can watch a game on the 55” HDTV with attached DVD player, play a game of foosball or air hockey. All bedrooms are masters, each with their own bathroom. Everything about this home invites you to relax and enjoy! 225 yards to beach access. Pool level powder room, volleyball court, outdoor sound system, picnic table. 8-person hot tub. 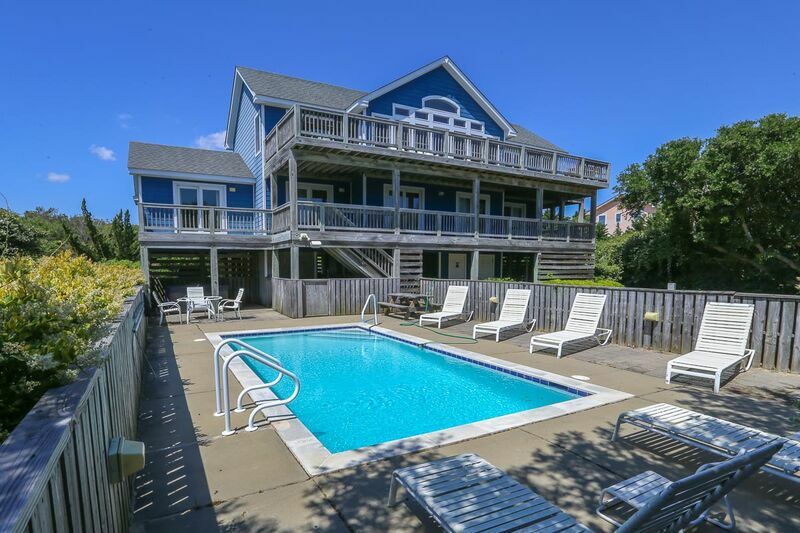 5 master bedrooms (4 master bedrooms with King, 1 with 2 Bunks sets), flat screen TVs with DVD players in each bedroom, bunk bedrooms have TVs, laundry room, powder room, ocean views, recreation room: 55” HDTV with DVD player, surround sound, wet bar, refrigerator, microwave. 2 master bedrooms (1 with King, 1 with 2 Bunk sets); king bedroom has flat screen TV with DVD player, bunk bedroom has TV with VCR player; wet bar, ice machine, powder room, great room with 47" HDTV with attached Blu-ray player, huge deck with built-in seating, outside sound system, gorgeous ocean views, video library, kitchen.